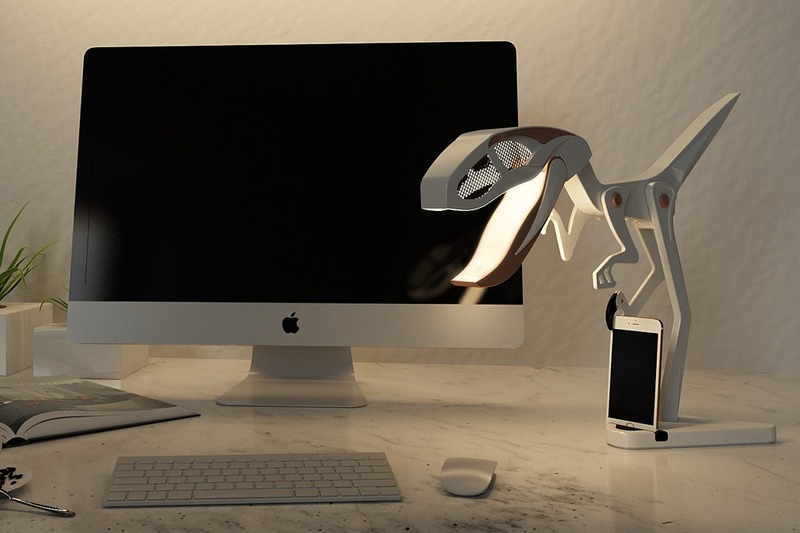 Unusual, fun, and perfectly timed with the Jurassic World movie, the Raptor Lamp 2.0 is a playful adjustable lamp modeled to look like a Velociraptor. Designed to be an item worth collecting first, and a lamp later, the Raptor Lamp sits on your desk, looking positively ferocious with its moving jaw and adjustable limbs. Crafted from aluminum and tough ABS plastic, the Raptor Lamp 2.0 comes with LED lights inside its mouth. Open or close the jaw to adjust the light, and to switch between a directional light and ambient lighting. The raptor comes with adjustable limbs that one can use to alter the beast’s posture, and even has an adjustable talon on the leg for that extra bit of attention to detail. The Raptor’s body comes with power and dimmer switches as well as an electrical input, while the base even docks your smartphone upright, making sure no one dares to steal it lest the velociraptor attack them! Available in a red+gold, white+rose gold, and gloss+matte black, the scary yet adorable raptor lamp makes a great toy as well as bedside accessories for kids and adult dino enthusiasts alike! Be sure to check 25 industrial table lamps.